In today's Corriere della Sera -- not online until tomorrow -- a nice interview with Juan Diego Florez, who tonight in Pesaro opens the much-awaited "Zelmira" at Rossini Opera Festival under dear Roberto Abbado's baton. The awesomest thing in the whole interview -- a nice big half page above the fold -- is that Juan Diego (who, unlike Riccardo Muti, is no Michael Jackson fan, he used to like heavier stuff, such as Led Zeppelin!) explains how he takes good care of his voice when traveling. On airplanes, he wears a face mask for the duration of the flight -- a face mask he keeps moist with water, so that the airplane's dry air doesn't bother too much his nose and throat. Just remember to remove it before you reach passport control Juan Diego!!! Smoking Venezuelan/Canary Islands temptress, mezzo Nancy Fabiola Herrera [*website has auto-play audio], has a small feature in this month's Vanity Fair España. Modeling her fiery-red Carmen look, she's buttressed by a lukewarm ~confessional~ from Juan Diego Flórez (read: bio lite). Click image for full size. Juan Diego Florez & Elizabeth Norberg-Schulz in Nino Rota's "Il cappello di Paglia di Firenze", la Scala, 1998, Bruno Campanella cond. ~*O.C. *~ is rawking exclusive pictures from the final dress rehearsal of Vincenzo Bellini's La Sonnambula at The Metropolitan Opera. Opening Monday, March 2, 2009, the production has our most favorite singers cutting up the stage: Peruvian tenor Juan Diego Flórez and French soprano Natalie Dessay, who will be doing anything but sleepwalking through the new Mary Zimmerman production. Like The Best Thing Ever: Juan Diego Flórez & Gustavo Dudamel Unite! Wonder Twin powers, activate! Form of Juan Diego Flórez! Form of Gustavo Dudamel! Caracas, Venezuela's Teresa Carreño Theater held two of O.C. 's most favorite opera Latinos last night in a stellar press conference. The two performers (with wives, Julia Trappe [Flórez] & Eloisa Maturen [Dudamel], in tow) spoke about their Latinolicious collaboration in the upcoming February 3, 2009 concert (to be held at the Carreño Theater). Flórez announced that his native Peru will hopefully soon follow Dudamel & Jose Antonio Abreu's Venezuelan youth orchestra "El sisema" example. Flórez will be singing Bellini, Donizetti and Rossini arias with Orquesta de la Juventud Venezolana Simón Bolívar and the chorus of Ópera Teresa Carreño, under the baton of Dudamel (natch). Proudly unwilling to let the gathering financial storm that will hit the world of heavily-subsidized Italian opera ruin their plans, Teatro Comunale di Bologna simply rawks. It's premiere night time this coming Thursday at Teatro Comunale under the baton of the new "direttore principale", 29-year-old Michele Mariotti: it's opening night time for Pier’Alli's new staging of I Puritani that will see, as Arturo Talbo -- a role written for Giovan Battista Rubini, by0tches! -- el mejor tenor ligero del mundo, aka Juan Diego Florez, aka the lamby prince of opera. Ildebrando D’Arcangelo aka Our Dear Brandolino will be Sir Giorgio, Netrebko wannabe Nino Machaidze -- who does not deserve a nickname yet -- will be Elvira. For you armchair musicologists out there, Mariotti has decided to use the Della Seta edition of the score, that reinstates three passages that had been later cut -- Bellini died shortly after the premiere -- because the constant requests for encores slowed down the action too much. Della Seta reinstates a Terzetto (Act I, scene X) for Arturo, Enrichetta & Riccardo called "Se il destino a te m’invola"; a part of the Elvira-Arturo duet (Act III, scene II) from "Ah! Perdona … ell’era misera" and the cabaletta a due for Elvira and Arturo (Act III, scene III) in the Finale ultimo, "Ah! sento, o mio bell’angelo". Besides that, there's also a bunch of high notes. And JDF. And Brandolino. Juan Diego Flórez Breaks the Silence & Speaks to Corriere, We Listen! Just when we were starting to wonder what that secksay superstar Peruvian tenor was up to, Juanes sat down with Milan's Corriere della Sera over the weekend, and shared a few thoughts. He spoke about the phenomenon of being called Pavarotti's heir to the tenor throne ("It made me really happy because he has been my idol forever, and I felt the responsibility of it all. "); his new Sonnambula CD with Bartoli ("I admire her enormously. "), his admiration of Bocelli ("He was able to open a new venue of music...combining a little bit of pop and a little bit of classical, although it's not really pop nor classical"); and his upcoming Puritani in Bologna. The last time you spoke to Corriere, you said that Pavarotti was doing well. However, he died a month later. Were you trying to protect him? "I remember well that day, I was at Pavarotti's place in Pesaro, it was the last time he ate at his house before he went to the hospital. Maybe I was trying to protect him. You could tell that he was suffering. But not even I would have thought that he would die so quickly. Alice, the little daughter, was running all around him, and was smiling sweetly." When you were a teen, you sang Led Zeppelin covers in Lima, and you had a band called "Graffiti". But would you also do pop duets like Pavarotti did? "I like that self-destructive English singer, Amy Winehouse. I would sing with my idols, Mick Jagger and Paul McCartney. It depends on the context. I had to do crossover with unlikely singers, and i asked myself -- what the heck am I doing here?" You sing frequently with Anna Netrebko: Are you tenors happier singing now with sopranos who are more like top models? [...] What's la Netrebko like? "Opera has become more and more a visual medium. A new wave of singers from Eastern Europe arrived who were really good and really thin, and their Western colleagues have been forced to follow their example. But it's not easy...anxiety after a show will push you to eating too much, and then you go to bed on a full stomach. If you're not careful, you end up getting fat." "Netrebko is exactly as she appears to be. We are all normal people. We just want to work and sing well. Once upon a time, you needed to be a diva/divo. If you weren't, people wouldn't take you seriously. Today it's different." Amy Winehouse? omg 2 kewl 4 skool. They tried to make me sing the Duke again, I said "No, No, No." We've been wondering what our little Peruvian lamb has been up to, hearing only small trickles of JDF news crossing our paths these past few months. Rest assured, no news is good news, as Flórez is chillaxing in London, preparing for the Thursday night premiere of Rossini's Matilde di Shabran with the Royal Opera House. (tho this is kinda scary: "PLEASE NOTE: ACT 1 runs at 2 hours 10 minutes without a scene change [...]") omg whaaaaaa? The show continues 5 more dates, ending on Tuesday, November 11 for its already completely sold-out run. Juan Diego Flórez will be dazzling the London audiences as Corradino with Matilde di Shabran sung by Polish soprano Aleksandra Kurzak, and Carlo Rizzi on the podium. While we're waiting for reviews and pics, we'll sate ourselves with this 1996 documentary when Matilde di Shabran was sung in August of the same year at Pesaro's Rossini Opera Festival with the rookie, AAA MVP player Flórez just up from the minors, and a baby Elisabeth Futral accompanying a fresh-faced Yves Abel. Here, Juan Diego Flórez talks about singing Corradino (in Italian with French subtitles) as a young little angnellino! And the rest is here, with with Yves Abel, Elisabeth Futral, Patricia Spence, and some other dudes. To force one's voice is risky: tackling a repertoire that's too heavy for one's voice provokes a loss of flexibility, unstable emission, harshness in the acuti and the problems become evident when one comes back to lighter, higher roles.... history is full of tenors who ruined their voices by pushing them too hard. Alfredo Kraus, perfect specimen of lyric-light tenor, advised caution with Verdi and complete abstinence from Puccini and Verismo composers. But agents, opera houses, record companies, they all want Verdi and Puccini. As Pavarotti used to say, that's the repertoire that makes a tenor famous. PS Do you know how much it costs to hire Juan Diego for a recital? 110,000 euros (US $170,000). Remember JDF's plan to sing the Duke of Mantua @ Teatro Real in Madrid, after his tryout in Lima and his debut in Dresden in a quite baffling production @ the Semperoper under Fabio Luisi's baton? Well, Juan Diego has "postoponed", ie canceled for the foreseeable future, his Madrid commitment and, perfectionist that he is, will not be singing in Rigoletto for quite a while. It is indeed a heavier role, much heavier and more potentially voice-damaging than expected. If he's not comfortable going ahead, and he clearly isn't -- the Lima tryout was just that, a tryout in a tiny venue, so the true test came in Dresden -- he's better off leaving the Duke alone for a few years. For all the corporate pressure that he's under to tackle the heavier, more popular stuff -- not just the Duke... Rodolfo? even, may the Lord forbid, Alfredo? -- Juan Diego and Maestro Palacio are very right in erring on the side of caution and of vocal longevity. Too many examples -- even in very recent months -- of very bad choices made simply to appear in a heavier, popular role not right -- or not yet 100% right -- for one's voice. OC enjoyed the live broadcast from Dresden, but she endorses our lamby prince's decision 100%. "the young Chilean tenor Juan Diego Flórez, possibly the best high lyric tenor in the world,"
Well, he might not be as good as that old Dutchman, Tito Schipa, in all fairness. First inning, opera: JDF as Romeo and Rolando as Tebaldo in Deserto è il luogo, from I Capuleti e i Montecchi. Then JDF in Ah leve-toi soleil from Gounod's Romeo, Ronaldino in O souverain, O juge, O Père from Massenet's Cid, then the All'armi duet from Rossini's Otello. The second part of the concert, "fue latinoamericana y sentimental". We lucky duckies who have Arte (best TV station ev4r) on our satellite feed, will enjoy on June 21 @ 9PM an almost live broadcast (a very bearable 2 hour delay) of Juan Diego Florez's European debut as the Duke of Mantua (after his Lima spectacular + wedding). Zeljko Lucic as Rigoletto, Diana Damrau as Gilda, the sehr kool Italian maestro Fabio Luisi conducting the new production by Nikolaus Lehnhoff. 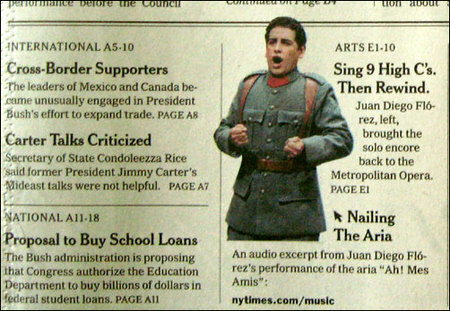 Opera supahstar Juan Diego Flórez is all over today's New York Times -- like Tilda Swinton & the Prada Spring Fairy line, like Vanessa Hudgens & her Balenciagas, like the Olsen twins & their Louboutins. Flórez wrastled some prime front page space, as well as two separate pieces in today's Arts section. 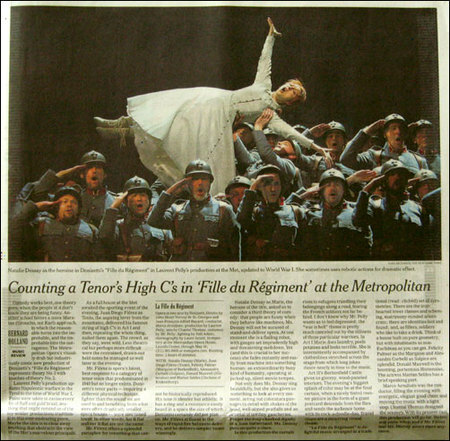 Bernie Holland's review of the Monday night premiere of La fille du Régiment ("Counting a Tenor’s High C’s in ‘Fille du Régiment’ at the Metropolitan") described set designer Chantal Thomas's sets as "gloomy" & "visually drab"??? Why so glum, Bernie? 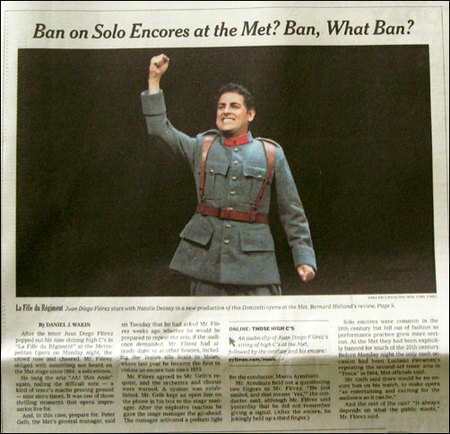 Daniel J. Wakin's "Ban on Solo Encores at the Met? Ban, What Ban?" needs more editor powah, made evident by announcing that the last performed encore at the Metropolitan Opera was in 1994 during the wrong act of Tosca. According to the Metropolitan opera database, the last performed encore on the Met stage was indeed during the October 31, 1994 Levine-conducted Tosca. With Pavarotti singing Cavaradossi, it was during his ACT III, SCENE 1 aria, "E lucevan le stelle" that Levine gave Pav the go-ahead for an encore (not during the "second-act tenor aria in Tosca" as Wakin wrote). The second act's big moment is Vissi d'arte obviously NOT a tenor aria. wtf nytimes factchekkas? Jayson Blair, is that u huneystar? See below for screen shots...and pics of the print pages for all my international readers.